CFO Press Release 4/28/2017 IN CASE YOU MISSED IT…NBC-2 Ft. Myers: "NBC2 Investigators: More arrests for food stamp fraud in Southwest Florida"
IN CASE YOU MISSED IT…NBC-2 Ft. Myers: "NBC2 Investigators: More arrests for food stamp fraud in Southwest Florida"
More people in Southwest Florida are being criminally charged with welfare fraud, according to an analysis of court records by the NBC2 Investigators. The majority of the people charged are accused of falsifying financial information when applying for the SNAP program, more commonly known as food stamps. 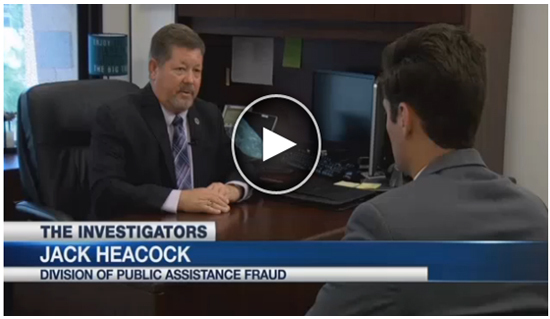 Florida Department of Children and Families Secretary Mike Carroll tells NBC2 his agency works vigorously to weed out welfare fraud to maintain the integrity of the system for people who actually need it. But if applicants get by the vetting process, it’s up to the Division of Public Assistance Fraud (DPAF) to get the money back. “Our primary role is looking at recipients who are committing the trafficking,” said Division Director Jack Heacock. Heacock says the most common form of fraud is people fudging their financial or household information when applying for or renewing their SNAP benefits. “False reporting, when they apply for benefits they don't tell the whole truth,” Heacock said. From 2012 to 2014, 31 people were charged with welfare fraud in Lee, Charlotte, and Collier counties. That number has nearly doubled in recent years. Since 2015, 71 people have been charged with welfare fraud, almost all of it from false reporting. “We're pursuing it more,” Heacock said. DPAF discovered $20,719,036 in fraud in FY 2015-16. Compare that to just $5,527,677 in FY 2010-11. · Store receives $100 reimbursement from government and makes $50 profit. “It's organized crime,” Carroll said. When stores are found to be trafficking in food stamps, the United States Department of Agriculture revokes them from the program. Through a records request to USDA, the NBC2 Investigators learned 16 stores in Southwest Florida have either been temporarily or permanently disqualified from the SNAP program in the last two years.